Awakening the inner spiritual power through different religious and spiritual practices!! Spirituality means different things to different people. Spirituality has a broader meaning than religion. Spirituality encompasses specific purpose and meaning in one’s life. It is the core part of human identity and values. It entails a sense of belonging to the higher power. It also can be expressed by instilling deeper sense and empathy for other people. People can awaken their spiritual self by doing a wide range of activities—for example, performing creative activities, living up to expectation and values, pursuing mindfulness activities, establishing a social connection, and getting closer to nature. Spirituality can enable us to forgive others, let go of grudges, and make us more tolerant and resilient during adversities. Spirituality can bring hope in times of suffering and help us make sense of our existence. Every person has his or her unique spiritual experience, which can be entirely personal without any religion involved. In other groups of people, spiritual enlightenment comes through performing certain religious rituals. Hence, different spiritual models work for different people. Addiction directs our endeavours to experience instant gratification from a substance-induced high. Addiction puts a band-aid to our inner suffering. Hence, addicted people stop longing for higher power, and they can’t appreciate how people around them can empower addicts to mitigate their suffering. Addiction seems to set up a trap while appearing to deal with our emotional trauma but drives us away from our innate spiritual strength of healing. Addicts seem to prefer the immediate pleasure of addictive substances over long-lasting inner peace and fulfilment. Spirituality has been proven to play an effective role in 12-step programs. Spirituality is not something we have to learn. It is part of our innate power. We just need to live it. 1. Some of our members are specialised in yoga and meditative practices. Anyone can utilize their services if they are interested. 2. Other ways of practicing it are by self-sacrificing to almighty God and pleading for help. 3. 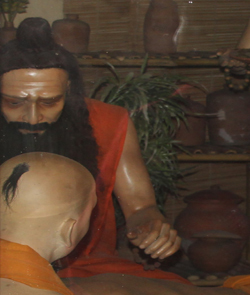 Local spiritual leaders such as a Guru, Maulana, or Temple priest are involved. The local community can recommend who would be most suitable in their locality to deliver this service. 4. Spiritual leaders use their wisdom and preaching skill to help with a social evil like addiction in a non-judgemental way. A non-judgemental or non-critical approach is crucial to increase the acceptability of this service. 5. Nasha Mitra spiritual services strive to cultivate a promotive and problem-solving culture rather than implanting a sense of shame in the sufferer.